This post originally appeared at The Rogue Adventurer. Identifying weapons systems can sometimes be a tricky business. Often, practitioners are forced to make educated guesses, or give ‘best estimates’ to stakeholders. Nonetheless, it is important that any such assessments are characterised accurately any time they are repeated, and the requisite caveats included. One recent incident highlights this pertinently. Some video footage from conflict in Syria featured remnants of massive 240mm mortar rounds – the largest calibre mortar currently in active service. 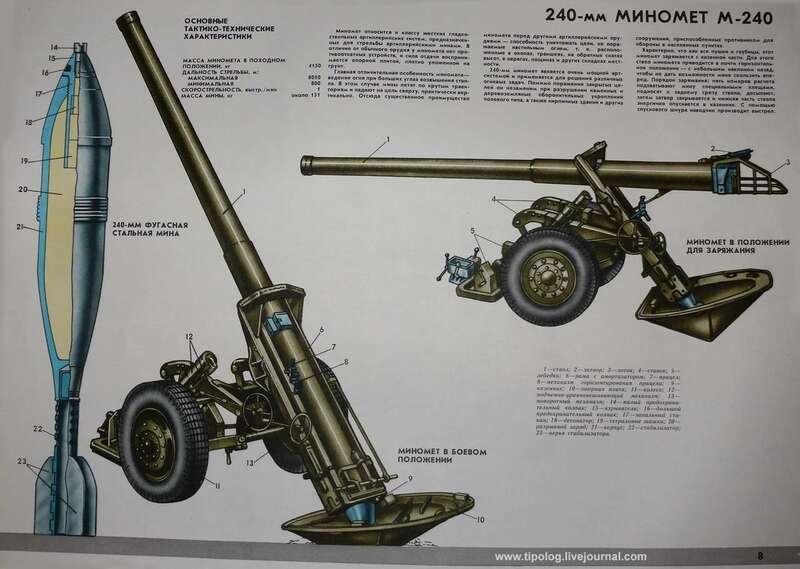 These are fired from two weapons in active service, both of Soviet/Russian origin: the M-240 heavy mortar, and the 2S4 Tyulpan self-propelled heavy mortar (a mechanised mortar carrier). Bjørn Holst Jespersen appears to have been among the first to have identified the tail end of what is likely an 53-F-864 240mm HE round, publishing a brief piece on the find on his blog on the 16th of February. The source of the original video screen captures can be found here. Human Rights Watch picked up on the presence of 240mm weapons systems at some point, publishing a press release on the 24th of February. I believe this has since been updated to reflect the likelihood of M-240 mortars being used, rather than 2S4 systems. A few days prior to the original release, the Christian Science Monitor published a piece, quoting a senior researcher at HRW, indicating that the 2S4 was in use in Syria. There are also several YouTube videos out there claiming Syrian armed forces are using the 2S4, including this animated video which is filled with inaccuracies (firing position, general appearance, etc.). HRW has since released two further press releases, both referring only to ‘240mm systems’, and adding valuable GEOINT/IMINT to the broader picture. This perfectly illustrates the point I am trying to make, and demonstrates how unverified reports or RUMINT can be spun into fact. I should state clearly that I have never claimed Syrian units were using 2S4 systems, and that I have seen no first-hand evidence to date to indicate that Syria possesses these. Later updates to Jespersen’s original blog entry show footage of the M-240 mortar in use, as do other videos available online. The consensus between most professionals is now that M-240 mortars are present, and not 2S4 Tyulpans. I am currently cataloguing the various 240mm ordnance available for the M-240 and 2S4 systems, including the Smelchak and Smelchak-M PGMs. This entry was posted in Weapons Systems and tagged 2S4, M-240, mortar, ordnance, Syria, weapons ID by N.R. Jenzen-Jones. Bookmark the permalink.